XTC Profiler - Temperature Data Logger for monitoring rework process when setting the temperature Data Logger for monitoring rework process when setting the equipment for rework (time-temperature relations) and also for Profiling of other Reflow Soldering Processes and Ovens. Powerful temperature data logging system. Reads 8 thermocouples, stores data, allows to print graphs etc. Real value. Will help you to know what your soldering tools are doing and observe process control requirements when reworking your boards. 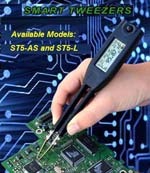 ST5-AS and ST5L SMT SmartTweezers One hand held, high precision LCR meter. Unique, indispensable tool to identify, sort, and verify the values of small SMT Components. Very practical during prototyping, service and QC. XTM-10 - "K" TC Meter and Tip Temperature Meter. Regular monitoring of solder tip temperature ensures that your soldering equipment is operating within specification and also provides you with reassurance that your process is safe.